DOVER AIR FORCE BASE, Del. 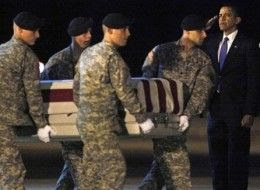 — Standing in the pre-dawn darkness, President Barack Obama saw the real cost of the war in Afghanistan: The Americans who return in flag-covered cases while much of the nation sleeps in peace. In a midnight dash to this Delaware base, where U.S. forces killed overseas come home, Obama honored the return of 18 fallen Americans Thursday. All were killed in Afghanistan this week, a brutal stretch that turned October into the most deadly month for U.S. troops since the war began.